Welcome to the Betfred Bingo Game Show! With the same community spirit found throughout, Betfred Bingo couples fantastic bingo rooms and chat rooms with plenty of chances to win big. Part of the Virtue Fusion network, Betfred Bingo has a range of Bingo rooms and wildly popular games like Rainbow Riches to suit every taste. The Welcome Bonus sees players receive £40 in Bonuses when they deposit £10. Players can also enjoy frequent promotions such as Winners Wednesday. A great site from a trusted name with 50 years experience. They offer everything including bingo, casino and live casino, poker, sports betting and more! You won't want to miss this site. From 10am to 11am every week day there are jackpots up for grabs in the Bonkers Room and tickets are just 1p and 2p! Every Thursday from 6pm with tickets tarting at just 1p, play to win up to £300. Also features Roll-On Bingo, XTG and Last Chance Saloon games. Here's a selection of the slots available at Betfred. They have loads more to keep you entertained for hours! Betfred has an app for that! Yes, you can download an app either for iOS for your iPad or iPhone or there's an app for those with an android phone too. Register on the Betfred Bingo platform (must be bingo platform, not games, for it to count) and you will earn Loyalty Points every time you stake on bingo games witbh your cash balance. The number of Loyalty Points you earn is dependent upon your VIP level. The 6 VIP levels range from Bronze up to Diamond. Loyalty Points can be converted to bonus funds or even cash, although converting to cash has a higher exchange rate so you don't get as much bang for your buck so to speak. We couldn't find a TV ad to share with you but Betfred Bingo have recently launched their Betfred Bingo Game Show TV Campaing so keep your eyes peeled when you're watching TV! 18+. T&Cs and wagering conditions apply. 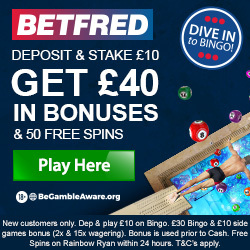 Check Betfred Bingo for full details.